Every devoted professional knows how hard it is to find an affordable cabinet saw that’s going to meet their expectations and needs. The market is flooded with various models, but only a couple of them are worth checking out. The others are either too expensive, or simply not worth investing in. The key is in finding the best suiting unit for one’s upcoming professional plans. Our full reviews are designed to offer as much insight about a particular model as possible. We are here to help you with the dilemma about which models are worth considering, and which ones aren’t. Instead of conducting an exhausting research and strolling around the Internet for hours, you can find all the necessary info here. As far as we are concerned, every model we decide to reviews is a worthy investment for a particular group of people. Take a moment and read the reviews, you’ll find them quite helpful. SawStop is a well-respected brand, especially among professionals who are in the business for a long time. As far as the quality goes, this particular company is near the top. However, the thing that makes SawStop special is their innovative safety system. This particular model is quite well-designed, sturdy, stable, and most importantly – reliable. It has more than enough power to tackle wood of any density and size. Speaking of size, the tabletop area is spacious enough for various demanding applications. Needless to say, it’s a pretty versatile and useful product. But, it may not be the ideal solution for people who are on a tight budget. The design is great, to say the least. Most models that we’ve reviewed have satisfactory designs, but this one stands out as one of the extremely well designed units. Everything is within reach, safe, and trustworthy. The measuring instruments are precise and neat. Many other models struggle with the miter gauge or T-glide fence, but this one is an exception. In fact, the T-glide fence is 36 inches and provides secure lockdowns meaning you don’t have to worry about deviations. The unit is fully enclosed. It’s beneficial for many reasons, but the main one is dust collection. While many other types have pretty subpar dust-collecting capabilities, the cabinet saws are by default better in collecting dust and debris. On top of that, the PCS175 model is known for excellent dust management. As we already said, this company is by far the most famous one when it comes to safety precautions. You can rest assured that every single unit that’s manufactured by SawStop features a ton of safety mechanisms. However, the most famous one is their patented blade-termination system. It works on a pretty simple principle – the blade carries a small electrical signal and as soon as it detects a change in conductivity – it stops in an instant. Due to the natural conductivity of the human body, whenever one touches the blade while in operation, it will stop within a millisecond. You don’t have to worry about precision and performance if you opt for this particular cabinet table saw. The sheer power and carefully crafted measuring instruments are more than effective when it comes to high levels of precision. There are plenty of things to like about this product. It’s one of the rare models that are simple yet extremely efficient. The first and most obvious thing many people like the most is certainly the safety system. Even though many other models can be considered quite safe, this one is near the top. The other thing we liked is the design and stability. Although it’s an aesthetical aspect, we think it should be mentioned regardless. In simpler words, some people might not like the way it looks, but a vast majority of buyers loved the aesthetical aspect. It’s quite futuristic, simple, and looks great in any garage. The elephant in the room is definitely the price. Even though it’s regarded as one of the best models on the market, the price is quite hefty. Therefore, people who are on a tight budget might want to keep looking and find something more affordable to them. On the other hand, the professionals appreciate its high quality and most people don’t have a problem when it comes to paying a premium price. The unit requires some assembly and fine-tuning. Inexperienced buyers might want to hire somebody to do the assembly part for them, even though it costs a bit more money. It’s always better to go slightly over your budget limits than to regret doing it yourself later. 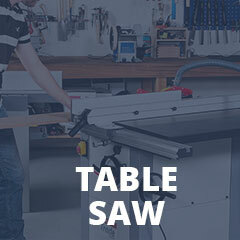 If you don’t know how to properly assemble a cabinet table saw, you’ll do more harm than good. As we said, not many DIY-ers buy this unit, but the pros that do are thrilled by its performance and overall quality. There will always be people that tend to find minor mistakes and trivial flaws, but those are at a bare minimum when it comes to PCS175. As far as we are concerned, this is one of the best cabinet saws out there. It has everything a professional need for their job. While many people expected it to be quite hard to use, it’s not the case. This model is extremely effective yet simple and user-friendly. As we said, if you’re a hobbyist, buying this unit might be overkill. On the other hand, if you’re a devoted professional, this is the thing you’ve been looking for. Take a moment and check its features out, you’ll see how useful and efficient it is. This article should be both starting and ending point for the ones seeking high quality and impeccable design.